13 May 2016, at 12:00a.m. US - The first part of May is always a good time to look at forward pricing some hogs. I actually used the date May 10th to look at hedging 4th quarter needs. Cash hogs during the summer months seem to take care of themselves. The fourth quarter is a different story. 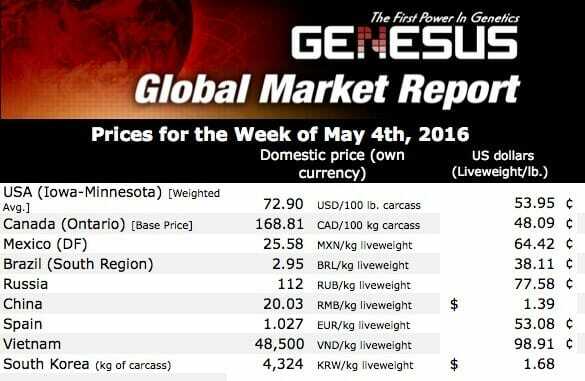 I read this week some market analyst predict that hogs will average below $60.00/ cwt carcass base in the 4th quarter. I tend to agree with him. So instead of being at the mercy of the cash market at that time, why not lock in prices now? The futures are actually giving us a chance to be above that prediction right now. October is around 70.50, December is at 65.35 and February 2017 hogs are at 67.90 (at least as I write this). Even subtracting the basis, it would still give us the ability to average over $60.00 for the 4th quarter. With grades added in that would be $50.00/ cwt live. Some might be thinking these numbers are nothing to write home about, but sometimes the key is to get to the next game. Historically there were not many times you could average $50.00 for the 4th quarter. October usually has a very good basis. Look at HTA contracts or actual basis contracts using October, December is a whole different ballgame. That basis can get nasty especially the second half of December. If possible, try to get as many sold by December 15 as you can. The holidays are brutal for basis and cash hog prices in general. Hedging the board is always an option, but remember eventually you have to address the basis when you turn that hedge into a live sale. The lack of demand for cash hogs during that time can keep that basis wide during December.